“The main leaders and organizers of this gathering who chanted unconventional slogans against the (Islamic Republic’s) values have been arrested,” Shiraz-based prosecutor Ali Saleh said, according to Reuters, which drew the comments from Iran’s semi-official Fars News Agency (FNA). Anti-Arab slogans were also chanted. 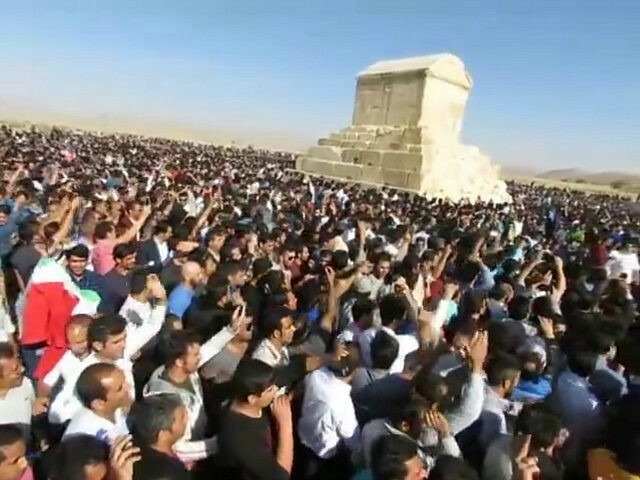 Prior to the October 28 protest, members of the Iranian Revolutionary Guard Corps (IRGC) and other Iranian authorities attempted to thwart the impending rallies by spreading rumors that officials had completely shut down the city, canceling tours to the site, sealing roads to Pasargadae, and shutting down the Internet. As Reuters points out, Iran’s last Shah Mohamad Reza Pahlavi linked his reign to Cyrus the Great, which is a major point of contention for clerics who attempt to diminish the pre-Islamic glory of Cyrus’s Persian Empire, which had Zoroastrianism at its core. Islam arrived in the year 651, during the Arab conquest that led the end of the Sasanian Empire and the decline of Zoroastrianism, eventually replacing it with Islamic rule.